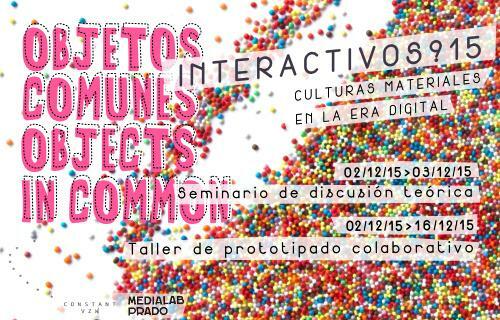 Call to collaborate in the project workshop Interactivos?’15: Material Cultures in the Digital Age, that will be carried out from December 2 to 16, 2015. Collaborators will participate in the production of the selected projects. The workshop is complete with a series of conferences and meetings and takes place in the framework of the project Common Objects, in cooperation with Constant vzw. Medialab-Prado offers free lodging to collaborators in youth hostels during the workshop (limited seating, shall on request and by order of registration).The last day to ask for a place is November 23. Click here to follow all the information about “Objects in Common” program. This entry was posted in Building, Hack, Hardware. Bookmark the permalink. Post a comment or leave a trackback: Trackback URL.